After getting the Junior Doctorate Degree in the Hội exam in 1901, following the tradition, Mr. Nguyen Sinh Sac and his children left Hoang Tru village and returned to his paternal hometown, Kim Lien village (also called Sen/ Lotus village). 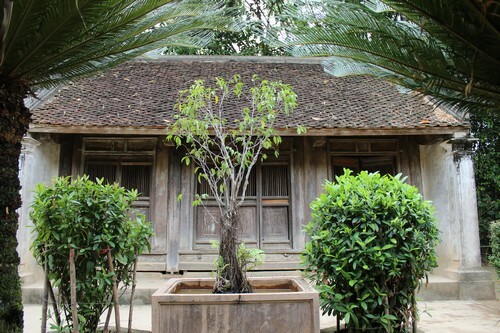 In Hoang Tru Relic, the small three- compartment house is the place where President Ho Chi Minh took his first breath; where was attached to the beautiful childhood years but also full of difficulty, hardship of Uncle Ho with his grandparents, parents, brothers and sisters. 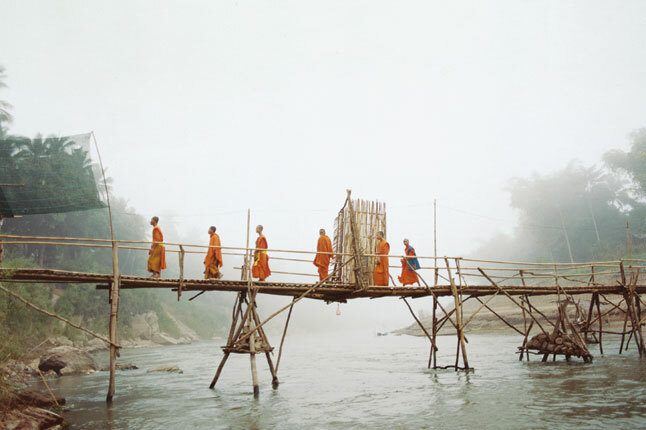 It is also where he received the love of the relatives, of the homeland, where he witnessed the thorough teaching of his maternal grandfather to his father. These spiritual values are the source of a great aspiration for the boy Nguyen Sinh Cung to become great President Ho Chi Minh, the liberation hero, the World’s Cultural Celebrity of Vietnam. Hoang Tru village, maternal hometown of Uncle Ho looks like a colorful and lively painting springing up the indescribable fretty feeling in the heart of visitors. The clumps of bamboos whisper in the wind, the small hibiscus (rose of Sharon) branches sway lightly. There are faintly redolent of areca spadix and grapefruit. Like many traditional villages of Vietnam homeland but Hoang Tru village is so simple, peaceful and sacred. 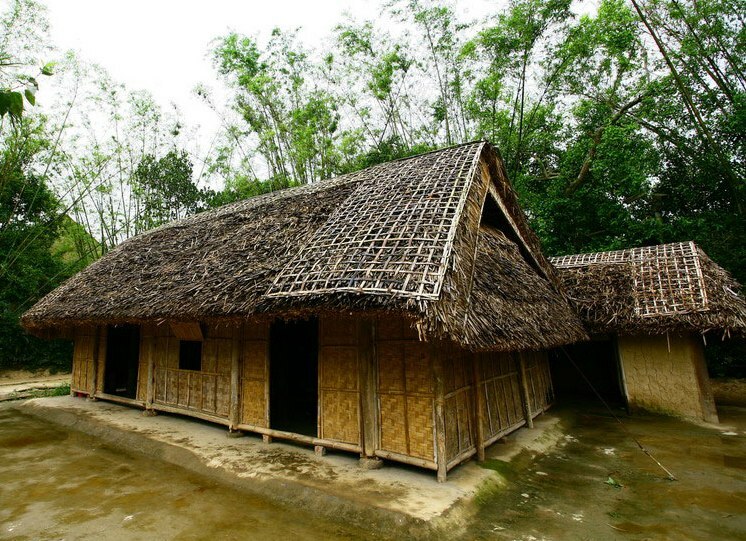 - The five-compartment cottage of Mr. Hoang Duong and Mrs. Nguyen Thi Kep, maternal grandparents Uncle Ho: In this cottage, in 1868, Mrs. Hoang Thi Loan, Uncle Ho's mother, was born. Born into a family of Confucian tradition and the teaching profession, so in the 5 compartment, the three compartments are used to be “classroom” and living place. 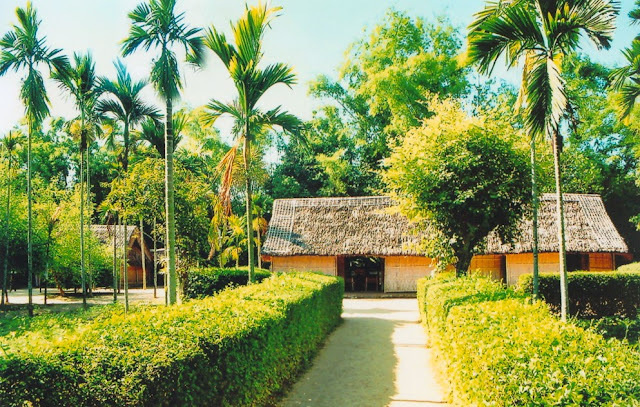 - Worship Hall of Hoang Xuan family: Hoang Xuan family was originated from Van Hoi village, Hoang Van commune, Yen Lac canton, Kim Dong district, Khoai Chau, Hung Yen province (Noi village, Chau Tien commune, Chau Giang district, Hung Yen Province nowadays). This is a family with traditional fondness for learning. The 6th generation of this family had a son named Kieu Hoang Nghia (1540-1587) who was appointed the division commander of Nghe An. This is the origin of Hoang Xuan branch in Nghe An. The worship hall has 3 compartments, one main and two sub- compartments. 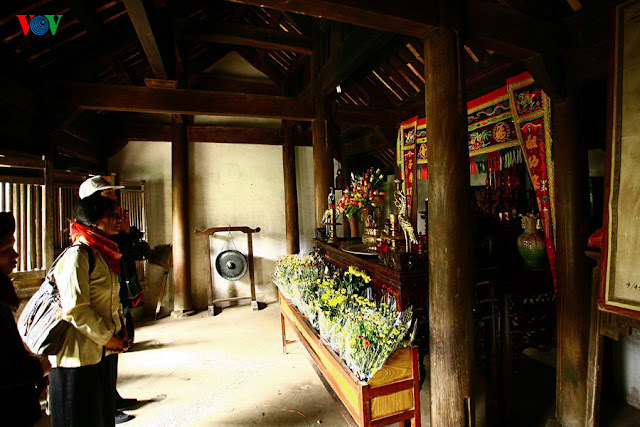 According the traces carved in the hall, this worship hall was built in the 34th year of King Tu Duc’s reign, ie. year Tan Ty 1881. After taking Nguyen Sinh Sac (father of Uncle Ho) home to feed and educate of 3 years, Mr. Hoang Duong built this ancestral temple. Initially, it was a thatched house, until 1930, it was restored and tiled. To the left of the five- compartment house of Uncle Ho’s maternal grandparents (on view from the outside) is the home of Uncle Ho’s parents. This is a 3-compartment cottage, there is a kitchen behind. This house was built in 1883 by Mr. Hoang Duong and Mrs. Nguyen Thi Kep on the occasion of the wedding of their first daughter, Ms. Hoang Thi Loan and their son-in-law, Mr. Nguyen Sinh Sac. The outer compartment is the resting place of Mr. Nguyen Sinh Sac. There were a camp bed, a desk two chairs. It was the beginning of his learning career and preparations for the examinations of Mr. Nguyen Sinh Sac under instruction and guidance of Mr. Hoang Duong. In the third compartment, there is a weaving loom that Mrs. Hoang Thi Loan used to weave cloth to feed the whole family and support for her husband’s study. The wooden trunk is placed in the middle compartment. This is the gift that Uncle Ho’s grandparents gave to Mr. Nguyen Sinh Sac and Mrs. Hoang Thi Loan when they live apart in this house in 1883. 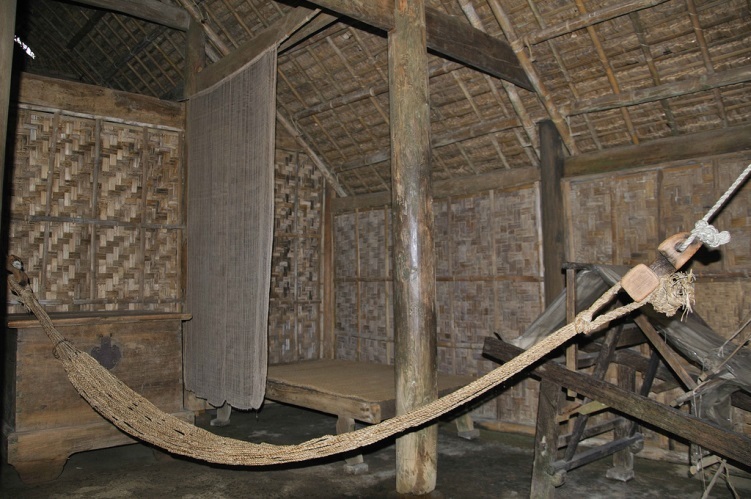 By the wall, there is a simple small bed made of neem wood, a bamboo ladder, the bamboo screen and mats. house of Uncle Ho’s maternal grandparents (on view from the outside) is the home of Uncle Ho’s parents. This is a 3-compartment cottage, there is a kitchen behind. This house was built in 1883 by Mr. Hoang Duong and Mrs. Nguyen Thi Kep on the occasion of the wedding of their first daughter, Ms. Hoang Thi Loan and their son-in-law, Mr. Nguyen Sinh Sac. thanks for sharing :) In Hoang Tru Relic, the small three- compartment house is the place where President Ho Chi Minh took his first breath; where was attached to the beautiful childhood years but also full of difficulty, hardship of Uncle Ho with his grandparents, parents, brothers and sisters. It is also where he received the love of the relatives, of the homeland, where he witnessed the thorough teaching of his maternal grandfather to his father. These spiritual values are the source of a great aspiration for the boy Nguyen Sinh Cung to become great President Ho Chi Minh, the liberation hero, the World’s Cultural Celebrity of Vietnam.